To the hunter, who follows carefully..."
Those words, written as long ago as 1569 in German, show not just how the bird-dogs operate but how ancient their skill is. Dr Caius's well known treatise of 1576, entitled 'Of English Dogs', was accompanied by an illustration of 'a field dog, for taking birds', which resembled a prototypal setter. 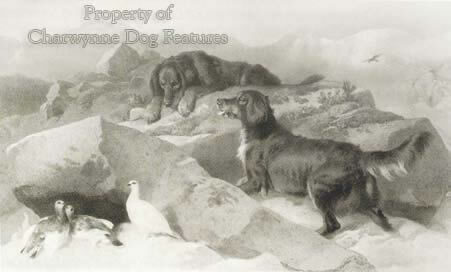 Caius described the action of the Setter or Index with these words: "When he hath found the bird, he keepeth sure and fast silence, he stayeth his steps and will proceed no further; and with a close, covert, watching eye, layeth his belly to the ground, and so creepeth forward like a worm." Half a millennium later, we still seek a comparable performance from our setters. It was extremely rare in Victorian books on dogs, gundogs especially, for any link to be made between our developing breeds of setter and pointer and those on mainland Europe. A concession was usually made over the origin of our Pointer, the most prolific authors without exception firmly linking this breed with Spain. Rawdon Lee accepts that the French had their own pointers before the Spanish Pointer was introduced into Britain at the beginning of the 18th century. He wrote that "Pointers far removed from the imported Spanish dog in appearance, were not at all uncommon in England and they could easily have been brought over from France." William Arkwright in his book on the Pointer quotes from a most interesting letter from the US vice consul in Valencia in 1900: "In this part of Spain there are no pure-bred sporting native dogs of any kind. The famous breed that existed here for three centuries - the Gorgas...are now extinct or so crossed with inferior breeds as to be indistinguishable. 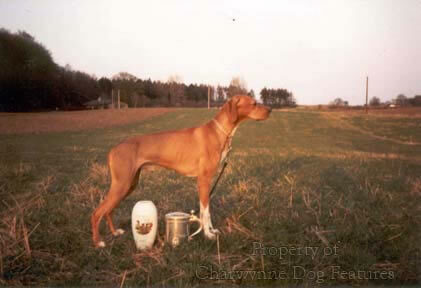 They were very nearly pure white, and much lighter than the old cylindrical Navarrese dog. 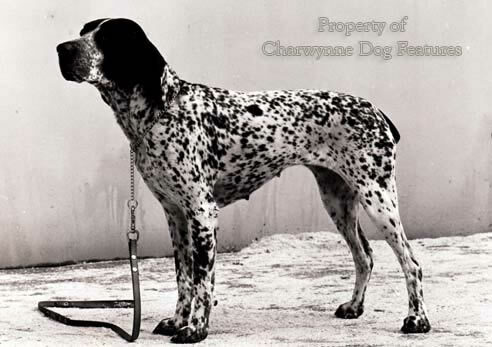 Tradition says they were of foreign origin, the first pair being presented by an Italian prince..."
Drury in his British Dogs of 1903 notes that the first record of the Pointer in Great Britain is the Tillemans' painting of the Duke of Kingston with his kennel of Pointers in 1725. He commented that the latter were the 'same elegant Franco-Italian type as the pointing dogs painted by Oudry and Desportes at the end of the 17th century.' Richardson, writing in 1847, describes seeing Italian pointers in Scotland, only about a foot high, but remarkably staunch with superb noses. The French have long had two sizes in their national pointing breed, the smaller - the Braque Francais de petite taille - being just over 18" at the withers. Our native Pointer is expected to be over two feet high at the withers, with no smaller version. The French have a wide range of braques or pointing breeds: the Braque d'Auvergne, the Braque Saint-Germain, the Braque de l'Ariege, the Braque du Bourbonnais, the Braque Dupuy - with few specimens remaining - as well as the Braque Francais in two sizes. They also have a good span of what we would call setters - their epagneul breeds: Breton, Francais, Picard, Pont-Audemer and Bleu de Picard. Despite this, many French sportsmen use our breeds. Now that our sportsmen have got used to the concept of all-round gundogs or hunt, point and retrieve dogs, the French breeds might in time have the appeal of the German breeds. The Brittany is well established here and the Braque du Bourbonnais already introduced. Only two French HPRs, the Brittany and the Korthals griffon, have so far made their mark outside France. Interest in the Braque du Bourbonnais here and in North America may be about to change that. After the Second World War only some 200 specimens of the breed existed, but now a well-planned resurgence is in place. An ancient breed from the very centre of France, its supporters claim that it has survived, without outcrosses, for nearly 500 years. 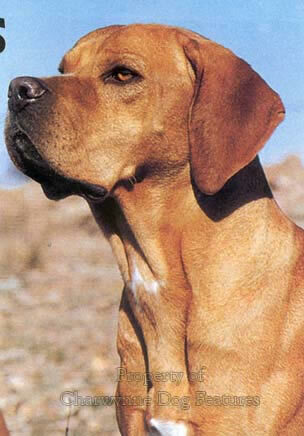 Less hound-like than say the Italian Bracco it reminds me, despite its coat colour of both the Hertha pointer of Denmark and the Portuguese Perdigueiro or partridge dog. One of the sadnesses in gundogs lies in the loss of old breeds, either through a lack of recognition or simply indifference to their fate. The English Water Spaniel once featured in the Kennel Club Stud Book, but is now lost to us. A number of distinct forms of setter were never perpetuated. The milk-white, curly-coated Llanidloes Setter would have provided a most distinctive element in our list of native setter breeds, had it survived. 'Stonehenge', writing at the end of the 19th century, described them as Welsh Setters, stating that their coats "would resist the wet and cold of the mountains in a marvellous manner." Is there not some proud Welsh patriot-sportsman out there who would be willing to re-create this lost breed? We have English, Irish and Gordon Setters from Scotland, where is the Welsh representative? Laverack mentions another old Welsh strain of setter, similar to the Llanidloes, but jet-black, stating that: "In their own country they cannot be beaten, being exactly what is required for the steep hill-sides." 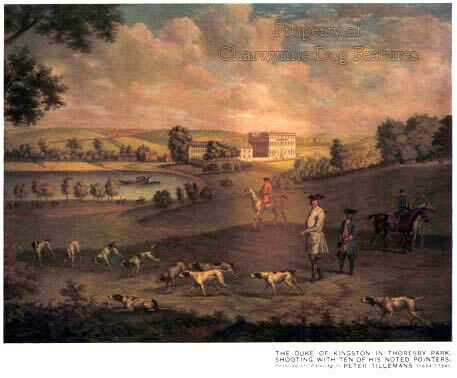 He also mentions the liver and white setters favoured in Cumberland and Northumberland, and the jet-black breed kept by the Earl of Tankerville. Interestingly, Laverack writes that the Duke of Gordon preferred black, white and tans in his setters, but kept black and tans too. You would not guess what the Duke's preference was from glancing at today's show rings for Gordon Setters. The breed standard of this breed states: Very small white spot on chest permissible. No other colour permissible. A few years back the best grouse dog in the country was a mainly white Gordon Setter. So what are the pure-bred native setter breeds like now that gene pools have been closed and coat colours become fixed beyond reason? Here are some extracts from show critiques in recent years. English Setters: "One worrying observation is poor forehands with upright shoulders and short straight upper arms were too much the order of the day." "I thought the general quality to be disappointing...On the day there were too many short or poorly angled upper arms...Where did the short-legged long-bodied English Setters come from?" and a third one: "I was disappointed to find too many upright shoulders and too few exhibits demonstrating good driving action." For three different judges at three different championship shows to make such basic criticisms of what should be a working breed is more than depressing. But the Irish Setter judges have important comments to make too: Crufts 1999 - "I wondered how these young dogs could have qualified in the first place with such obvious faults." "I found every variation of faulty action, mostly due to incorrect conformation, with upright shoulders and short steep upper arm far too prevalent." And a third critique (in the red and whites) read: "...there seems to be a tendency for upright shoulders to be growing more prevalent." But what about Gordon Setters? Here are extracts from three critiques on Gordons: "Movement on the whole was disappointing and I believe there are two main reasons for this. First and most important, incorrect angulation of either/or both fore and hind quarters..." "My main area for concern is shoulders, upright shoulders and short upper arms make an animal look square at the front, many, when viewed from above had coarse lumpy shoulder blades..." and, thirdly: "Certainly I was disappointed by the number of poor hindquarters, with some dogs looking really cow-hocked and with very poor and weak hindquarters." All of these critiques make sad reading in breeds designed to be functional animals with a testing sporting role. How can any dog claim to belong to a breed if it is simply incapable of carrying out the function for which the breed was intended for? We may have lost some distinctive breeds from neglect or a concentration on a sister breed, but are we going to destroy the surviving breeds of bird-dog by ruining their anatomy? One recent critique on the Pointer read: "Many judges before me have written about correct construction which seems to be disappearing particularly with regards to the whole of the front assembly." Another read: "...I am afraid that 70% of the exhibits had simply appalling movement, both fore and aft." If these setters and Pointers are the ones presented at championship shows, what are the others like! Of course, any and every breed receives criticism and this is hardly new. A correspondent to the Kennel Gazette of February 1890 wrote: "I have read Mr Serjeantson's remarks on Irish Red Setters in your number for this month, and probably he may be pleased to learn that very many of the most experienced breeders in Ireland fully endorse his opinions, that latterly breeders of the Irish Red Setter for show purposes have sacrificed the grand old powerful big-boned animal for the sake of beauty, chiefly in colour, coat, and feathering, and have thereby produced the many present-day weedy successors of the old type - no doubt beautiful, but weedy in bone." A correspondent to the November issue of that year's Gazette wrote: "In conclusion, I must say that there is no breed of setters that could improve the best strains of Irish. Of course there are, I regret to say, men who keep Irish setters almost exclusively for show, and I could mention one or two well-known Irish setters that live half their time on the bench...Why cannot such men confine themselves to pugs or poodles?" Against that background it is easy to see how and why any setter breed divided into show and working arenas. But is it good for any bird-dog to have an anatomy which would handicap it if it worked? A working dog doesn't need a superdog structure just a sound one. No doubt the field trialists and shooting fraternity will say, with a collective sigh, let the two worlds, show and working, get on and do their own thing, quite separately. But what does that do to a gundog breed? We are losing breed type in many working gundog strains and sound construction in many show strains. That cannot be good for the long term future of any breed; should the two worlds always be totally apart? In some hound breeds the show people involve those who work their dogs, in Otterhounds, Beagles and Bassets, for example. Some sighthound breeds are tested on the racing track, but I doubt if such a sure test of sound construction is a factor in show dog breeding programmes. For me the survival of the Boulet griffon and the survival of a sound setter or pointer breed are equally important. We have inherited these splendid dogs from devoted pioneer breeders who dedicated their whole lives to the production of functional animals. It may be naive to expect the divisions between the show and the working worlds to become blurred, for the benefit of the breed concerned. But it is entirely reasonable to expect show fanciers to go and watch their breed at work and then understand what the drafters of the original breed standard had in mind. It is easy to exploit a breed in the field or in the ring but to what gain for the breed?